Figure 10 Anatomic right renal artery and vein variants. (A) Two right renal artery origins are seen (arrowheads) along with an accessory right renal vein (arrow). 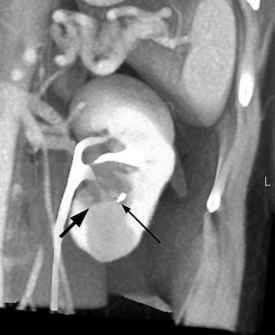 (B) The main right renal vein is seen (arrow) along with an unusual branch of the vein (long thin arrow) that results in a third renal vein entering into the inferior vena cava. The plane in image (B) is slightly more anterior than in image (A). Figure 11 Accessory right renal artery. Vascular phase volume-rendering shows the main (vertical arrow) and an accessory right renal artery (oblique arrow). 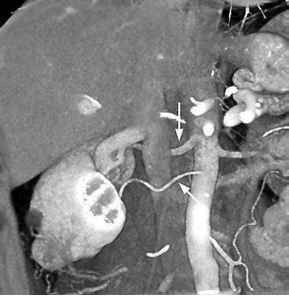 Right renal arteries that arise inferior off the aorta often course anterior to the IVC, as in this patient. Abbreviation: IVC, inferior vena cava. Figure 12 Depth of tumor extension. Tumors that extend into the renal hilum (arrow) will often abut larger vessels and the pelvocalyceal system (thin arrow). This is important for the urologist, who may opt for conservative surgery or be ready to anticipate repair of the collecting system and cauterize the vasculature. Figure 13 MRI of renal cell carcinoma. (A) Precontrast, (B) equilibrium postcontrast fat-saturated 3-D gradient echo T1-weighted (VIBE) images, and (C) subtraction image of a partially exophytic right renal mass (arrow). 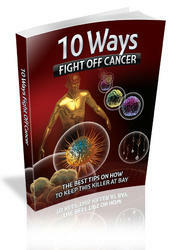 Tumor enhancement on the postcontrast image is confirmed on the subtraction image. This is most helpful when there is a high precontrast T1 signal in the investigated lesion such as that from internal hemorrhage. 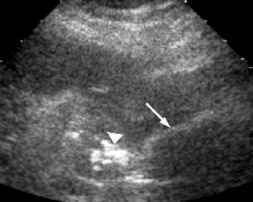 A laterally located renal cyst does not enhance and is black on the subtraction image (arrowhead). Abbreviations: MRI, magnetic resonance imaging; VIBE, volume interpolated breath-hold examination. Figure 14 Volume-rendered arterial phase MRI for renal vasculature. 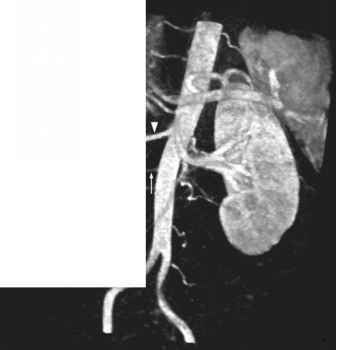 Both the main right renal artery (arrowhead) and a small inferior accessory renal artery (thin arrow) are demonstrated on this volume-rendered angiogram. The partially exophytic tumor (arrow) is also seen. The arterial phase fat-saturated 3-D gradient echo T1-weighted (FLASH) data was used to create the image. Abbreviation: MRI, magnetic resonance imaging; FLASH, fast low-angle shot. probes are smaller in size than conventional probes and are specifically shaped for the operative environment. The ultrasound transducer can be placed directly on the surface of the kidney during an open partial nephrectomy. The laparoscopic ultrasound transducer is constructed with the transducer elements on a flexible arm that fits through a 1 cm laparoscopic port. The transducer elements can typically be steered into different positions, although there are some limitations related to the locations of the access ports and the flexibility of the transducer. Doppler capability is helpful in facilitating the identification of vascular structures and their proximity to the surgical site. During open partial nephrectomy, the urologist can palpate masses that extend to the renal surface. During these procedures, ultrasound is used to localize small intrarenal masses and to assess their proximity to the central sinus structures, the pyelocalyceal system, and vessels. The margins of the mass are demarcated on the renal surface using ultrasound, and then electrocautery is used to score the kidney surface. A search for additional lesions that may not have been identified on preoperative imaging is also performed. During laparoscopic partial nephrectomy, unless a hand-assisted procedure is performed, the ability of ultrasound to localize a renal mass is invaluable because the tactile cues available during open surgery are not available. Most masses treated laparoscopically are small, and some may not be visible on the renal surface. 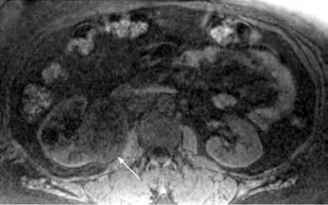 Figure 15 Renal vein evaluation by MRI. 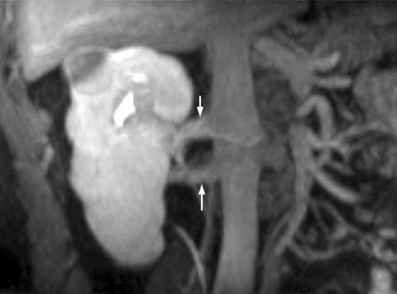 Oblique coronal thin MIP images show (A) two right renal veins (arrows) and (B) a left renal vein expanded by tumor thrombus (arrow) that does not extend to the IVC but is seen to extend into the left adrenal vein (arrowhead). The images are derived from the equilibrium phase postcontrast fat-saturated 3-D gradient echo T1-weighted (VIBE) data. Abbreviations: IVC, inferior vena cava; MRI, magnetic resonance imaging; MIP, maximum intensity projection; VIBE, volume interpolated breath-hold examination. After identifying the mass by ultrasound, the surface of the kidney is scored using electrocautery as during the open procedure. 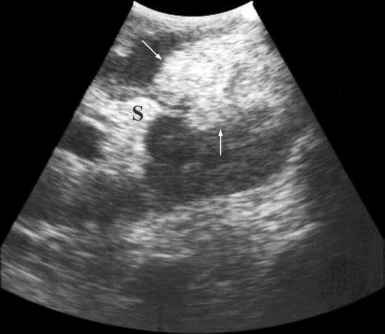 Figure 16 Intraoperative laparoscopic ultrasound shows an ovoid hyperechoic mass (arrows) that extends from the lower pole into hyperechoic fat of central renal sinus (S). 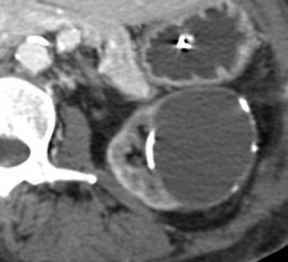 posteriorly or laterally located mass, whereas the transperitoneal approach is used for an anteriorly or anterolaterally located mass. Once the kidney is mobilized and fat excised for pathological analysis, the tumor and the remainder of the kidney are imaged with ultrasound. The mass is biopsied and then punctured with the ablative probe under ultrasound guidance. The probe is visualized as an echogenic line that casts an acoustic shadow. Figure 17 (Figure on facing page) Laparoscopic ultrasound monitoring of renal cryoabla-tion. (A) Initial image shows the mass (arrow). (B) As cryotherapy begins, iceball formation is seen as a short hyperechoic arc (arrow). (C) As the iceball enlarges, the hyperechoic arc (arrows) increases in size and shows increasing shadowing. Figure 18 Percutaneous ultrasound guidance for renal radiofrequency ablation. The radio-frequency ablation electrode is seen as a linear echogenic structure (arrow). As the procedure continues, additional bright echoes (arrowhead) obscure the renal mass. ensure complete ablation. Extension of the iceball more than 3 mm beyond the tumor margin ensures adequate freezing of the lesion resulting in desired cell death (20). During radiofrequency ablation, an electrical current flows from the tip of a needle electrode into the surrounding tissue toward grounding pads that are placed on the patient's thighs. This leads to heat production and coagulative necrosis (21). The adequate treatment temperature is between 70°C and 100°C. When monitoring the ablation, increasingly bright echoes are visualized from the electrode tip on ultrasound due to microbubble formation (Fig. 18). This provides a rough estimate of the size of the treatment area (22). Larger lesions require the use of multiple overlapping treatment zones to achieve adequate coverage for complete ablation. However, the extent of coagulation cannot accurately be predicted and post-procedural imaging is necessary in order to assess the success of the ablation. Can I bill ultrasound guidance for laparascopic partial nephrectomy?